We are delighted to report that Wiltshire is the latest county to adopt a county day. Wiltshire Day is held on 5th June and is a chance for Wiltshire people to celebrate the county’s people and places, its rich history and heritage, its remarkable and beautiful landscapes, its culture and, above all, its place in the hearts of its inhabitants and of all people who love our counties. The event was supported by local people, clubs and societies, councils, businesses, local media and even police forces across the county. 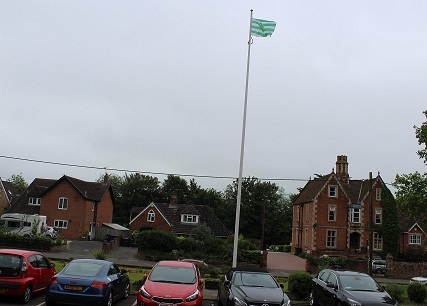 The Wiltshire Flag, created by Mike Prior and featuring the great bustard, was proudly flown throughout the entire county. We love our counties everyday but a county day is a wonderful chance to join together and share the love for our county once a year. It is also a great way to get media attention and to involve schools and young people in understanding and appreciating the importance of their county and of all our counties. There are lots of photos from the day on the Wiltshire Day twitter account.